Has anyone tried the ZWO ASIair WiFi? I've been using the AIR with a CGEM with no issues. It works with the guide cam in the ASI183MM Pro or the AIR directly, however the choice of USB to Serial cable - then to the serial cable for the CGEM seems to make a bit of difference. Just select the AVX since it is basically the same controller and it all works well. It works just as well on an iOptron CEM25P especially if you buy the custom USB to RJ11 cable to avoid the Serial 9 Pin connections. I have yet to try that with the CGEM, it might work.... You can't use StarSense, I use SkySafari, Cartes du Ciel, both work just fine.I have not seen any issues with the mount continuing on after a GoTo from the AIR App or SkySafari, but you should always PA, then Plate Solve and then sync to the mount. If there are any discrepancies between the settings on the hand controller and the AIR config, things do get quite confused. 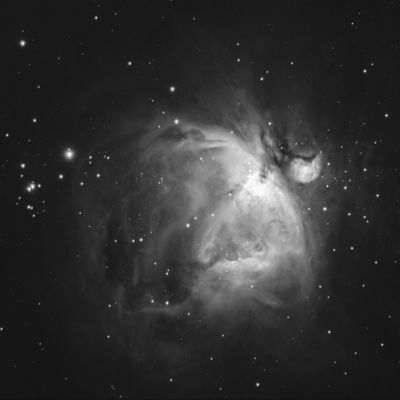 I got an ASIAIR and is a great tool for intermediate astro-imagers. So intuitive and concentrates almost the whole process in ope app (previewing, focusing, platesolving, capturing, guiding)...Electronic focusing feature is coming soon. Simply, i love it ! !..and i consider it quite better than Stellarmate. Every guy who considers to go deeper in astrophotography, should have one. One of the best things about the ASI air that I really appreciate is the total lack of lag between subs (as opposed to my experiences with SGP). This is most prominent when taking short exposures... instead of losing valuable time between exposures waiting for SGP to move on to the next image, the ASI air is seamless. Time is a valuable commodity and I've got 3 of them now, one dedicated to each rig. With any planetarium program, if you are polar aligned, then all you should really need to do is do a sync, to get the mount and planetarium program in sync with the sky. Or do a plate solve. Now it depends on the mount. Some mounts like many Celestron require that you do an alignment before they will start tracking. The ASIair is locked into only ZWO cameras and only ZWO filter wheels. It's my understanding that the ASIair also does not allow a remote desktop connection. You might want to consider a Stellar Mate or loading up your own Raspberry Pi with INDI, Ekos and Kstars. You could install the INDI version of the PoleMaster with these. Stellar Mate is more of an open system, you can buy it complete ($155) or you can buy a Micro-SD card with the OS and software preloaded ($49) and then plug it into your own Raspberry Pi. You can purchase your own Raspberry Pi and install the Linux OS, INDI, Kstars, Ekos or CCDciel and Polemaster software and be up and running for about $65. You can do plate solving with any if these solutions. Linux OS, INDI, Ekos, Kstars, Stellarium, Carted du Ciel, CCDciel software is all free. INDI is the Open Systems equivalent of ASCOM. It runs on a bunch of operating systems and supports a bunch of devices. Most of the mount and camera manufacturers have INDI drivers available. You need to be reasonably computer literate to install and configure the software on a Raspberry Pi. Can you run a ZWO camera off it? Two actually one for imaging and one for guiding. It is a good tool. The only complaint I have is the range of the wifi. If you go to a different floor of your home, you get intermittent connections. It is not reliable even at 2.4 GHz.....a range extender is needed. The current beta version has support for many DSLRs. My Canon 6D is among them. This is a nice benefit, being able to do focusing, dithering, guiding and timed exposures with the 6D. It sort of replaces Backyard EOS. Have you actually been able to download the beta version and use it? Yes. Ask them for it and they can add you to it. In the interim a friend of mine built a Stellarmate so I'm going to try that out with Ethernet as opposed to WiFi and see how that works. I'll use it on the CGEM for now, I might be able to get everything working and I'll report back her on the main differences. That actually has a PA tool AND already supports DSLR's and various mounts. I don't really do any visual, I'm imaging narrow band so accurate PA for 300 second exposures in HA/OII/S11 is rather important. I tend to use Sharpcap to get PA as close as possible, drift align if necessary, then start shooting. I don't really do any unguided shooting, although if I could afford a RASA I probably would. I just don't have $1700 spare right now. All joking aside, it would be a nice to have feature rather than using a separate computer/software setup to get PA then plate solve and shoot with the ASIAIR. Apparently it is a feature that may well be included in the future, however IMHO it should have been a priority. You can't get Ha unguided or without pretty accurate PA.
Edited by Starblind, 24 March 2019 - 01:20 PM. I agree with your comments. PA should somehow be included. I am running all ZWO cameras (guiding and imaging) and the ASI AIR application basically cannot be started until the scope is polar aligned and two or three star calibrated. All of this should be included in the application.. Thanks will do. I have ZWO cameras but I also have a DSLR I would love to use as well in some applications. solved all connections issues i've had at first. in preview mode. It would make multi-night imaging easier. a flip function to the same coordinates in the mount controls panel. of what's on the image. what range extender did you use? I find the range Absolutely horrible! a few metres at best! through glass door, forget it. I'm using a TP-Link AC1750 through a wall and a glass door, about 15 to 20 meters. Do place the extender on an outlet outside or on an outlet or inside your house? Thanks. Both placement worked. Since i tend to forget about it, i prefer inside, just by the glass door. other end of the house. When I plug my canon 6d to my asi air it’s esily detected. Wheni do do the same with my Nikon d5500 (and turn camera on and in M mode)I don’t see the camera as a choice in the initial drop down for cameras. Amyone know now the issue? On the canon I use a mini USB port on 5e camera body. On the Nikon I have a Usb cable plugged onto the lower port ...the one that has the USB icon and AV out. Asi Air connect to the nikon but can to the canon? I have a question about AsiAir. I just got one and am having problems connecting it to my phone which doesn't support 5ghz WiFi. I know the Air defaults to 5ghz and can be changed to 2.4ghz through the app but since the app won't allow you to do anything until connected I'm stuck. Does anyone know how to switch the Air to 2.4ghz without using the app? Is there a config file on the Pi that can be changed that will make it boot using 2.4ghz? Or are the any other methods to make this happen? Appreciate any help. Which iPhone is it? All 6 and above support 5Ghz automatically, if the ASIAIR does not show up then the WiFi isn't working or it isn't booting up. You don't get to choose 5Ghz on the iPhone, you should name your WiFi 2.4 or 5G so you know which is which, but the problem is unlikely to be the iPhone. You should be able to see the WiFi network from an iPad, iPhone, PC Laptop or Android device if it is broadcasting. Mine shows up on every device in the house. I don't have an iPhone, running Android on an LG x-charge which doesn't support 5ghz only 2.4 unfortunately. I can see the Air from my laptop so I know it's broadcasting. I can't find a PC app for the Air, if there was something available then I could login and make the frequency change via that app. Again just need to switch the Air to 2.4ghz somehow. I've contacted ZWO but haven't heard anything back yet.